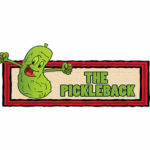 The Pickleback Bar offers a host of craft beer and good quality liquor and well of course, Picklebacks with all kinds of twists. We have daily drink specials and a weekly lineup of karaoke, music bingo, game night, trivia, Sunday brunch and a full food menu. We have plenty of TVs to catch the games and on the weekends, we host dance parties & live music events of all genres.